Keeping down the cost of keeping up your home. Get It Done Right with Hansons! There are few chores more dreaded than cleaning out the gutters. From dragging the ladder around the house to digging out wet leaves and debris, cleaning out the gutters is a task no one looks forward to doing! But don’t worry! Hansons has a solution! 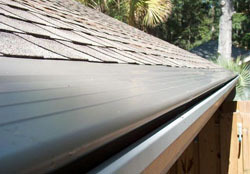 An American made gutter system that utilizes the highest quality materials around and comes with a 100% NO CLOG guarantee. 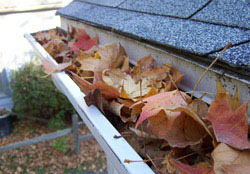 Gutter grate is easily installed on all existing gutter systems, both old and new, blocking any and all debris from entering your gutters. Available in 5” and 6” sizing comes in six different colors to match your decor. Micro-mesh cloth technology strategically weaves together medical grade stainless steel to ensure nothing but water gets into your gutters. Our patent pending dip technology sets us apart from other companies. Using three inward dips, our product allows water to get through even when there is heavy debris. 15 year labor and material guarantee gives you piece of mind that your investment will not go to waste. 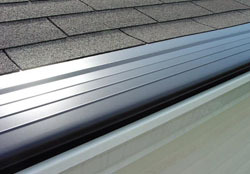 Our gutter guards protect your gutters against anything entering them except water. A single pine needle won't get past Gutter Grate! This is one of our high performance premium packages. It comes with a 15 year labor and material guarantee including cleaning if necessary. The Gutter Grate base is covered with a fine stainless steel membrane *(patent-pending) that prevents any particle larger than 100 microns (1/2 a grain of sand) from entering your gutter. Dozens of leaf guard screens utilize expanded metal, but they (like the majority of perforated plastic and metal products) tend to channel water right past the gutter and onto the ground due to water surface tension principals. 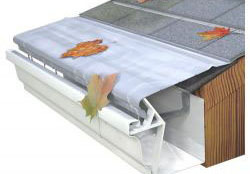 Gutter Grate has an exclusive patent-pending "inseam" that forces water into your gutter.